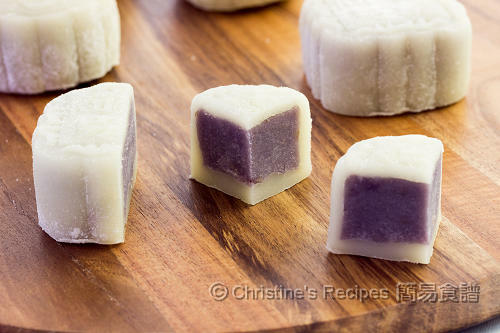 Ever thought of using purple sweet potato to make some snowskin mooncakes for Mid-Autumn festival celebration? Both the texture and taste are wonderfully good. After the first attempt of making mooncakes used my own branded mould, I was itching to make another batch with a different filling. A purple sweet potato (purple yam) has been sitting in the basket on my kitchen benchtop for quite a while. Guess that it’s perfect for my second attempt. The purple sweet potato grown in Australia is quite dry itself, with less water content compared with other kinds of sweet potatoes. I don’t need to stir fry the filling very long and was quick to get a very satisfied result. By blending it with some coconut cream, the filling was infused with a pleasant coconut fragrance. This batch of snowskin mooncakes turned out great that I happily wrapped up my cooking for this year’s Mid-Autumn festival. To prepare the filling: Cut the peeled sweet potato in slices or cubes. Cook in a microwave oven or steam until softened. Press through a fine sieve. Add sugar. Mix wheat starch with water, then pour into the mashed sweet potato. Stir in coconut cream and oil. Transfer to a non-stick pan and cook over medium heat. Stir occasionally until most of the moist is dried up and the wheat starch is cooked through. Cover with plastic wrap and chill in fridge for later use. To prepare the snowskin: Sieve all flours in a large mixing bowl. Add sugar, milk and condensed milk well. Stir in vegetable oil. Drain through a fine sieve into a large and shallow pan. Cover with foil and steam for 15 to 20 minutes over medium high heat. Let it cool down. Divide the filling into 8 portions, each in 32 grams. Roll each into a ball. Scrape out the snowskin dough. Knead until just combined. Divide into 8 portions, each in 33 grams. Roll each out into a disc. 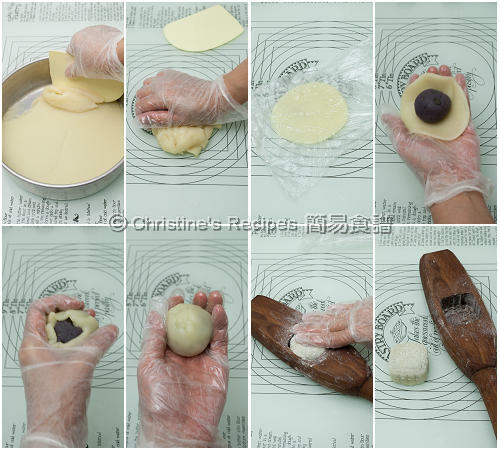 To ensemble mooncakes: Wrap the filling with the snowskin dough tightly and seal the edges. Coat with cooked glutinous rice flour. Shake away the excess. Press in a floured mooncake mould. Tap and remove it. Store in an air-tight container covered with a kitchen paper. Chill in freezer overnight. Transfer the mooncakes into fridge for 2 hours before serving. Mashing the sweet potato through a fine sieve is quite a tedious part. Yet, by doing this, you’ll get the finest and smoothest filling. I used a microwave oven to cook the sweet potato so that the water content was minimized as a result the cooking time in the pan was shortened. Remember to cover with a foil while steaming the snowskin. Otherwise the dough will turn sticky. Try to dry up the filling as much as you can to avoid icy texture after chilling. Oil is the essential ingredient combining the filling together and making it feel smooth and soft. Pressing the cooked purple sweet potato through a sieve is quite tedious. A potato ricer or masher can save much of your effort and time. The purple sweet potato filling looks really amazing! Gorgeous colour contrast. Lovely mooncakes. Wishing you and family a happy mid autumn festival. Your mooncakes look amazing! I am looking to buy a mooncake mould. They come in 50g or 75g. Which size do you recommend for your receipes? Most of my mooncake recipes I posted on this blog made by my 50g mould. But this mooncake mould on this post, 65 grams, was a birthday present from my family. If you have the budget, you might like to get both of them. Hi Christine, when I cooked my filling it became quite oily. Is that normal? Hmmm... Guess that the purple sweet potato we used were different. Mine needs more oil and liquid. 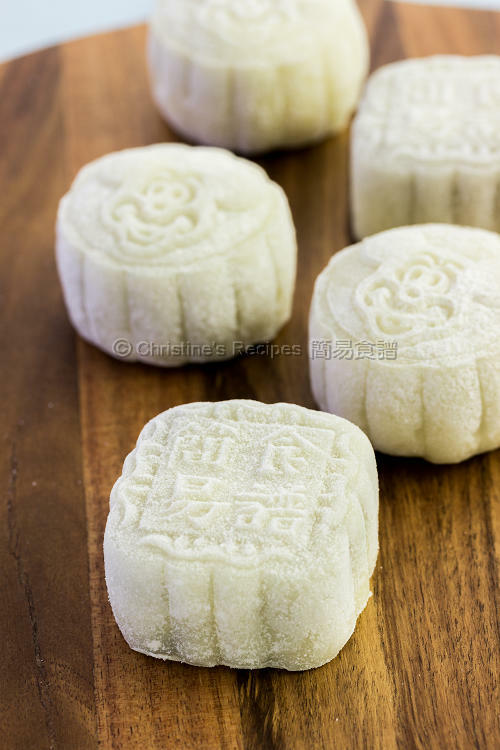 You might decrease some oil when you make these mooncakes next time. Add oil bit by bit and try get the right texture you want. Beware not to get it too dry though. After freezing, it might crack otherwise if not enough oil is added. Hi, can I change the sweet potato to pumpkin? And what is tang zhong? Yes, pumpkin is also a good choice. As for tangzhong, please take a look at this Japanese Style Bacon and Cheese Bread recipe . I shared the info in more details. It might help. Does normal asian grocery store usually sell already cooked glutinous rice floor that you use for coating? Or do we have to cook it ourselves? How do you go about cooking the floor? Yes, Asian grocers usually sell cooked glutinous rice flour. It's very handy. Or you may make some yourself. Simply cook some glutinous rice flour in a small pan, without any oil, over low heat for about 3 minutes, until you see a bit smoke arises or smell some flour aroma. It says "糕粉" on the packaging. If you can't get it anywhere, you can make it yourself. 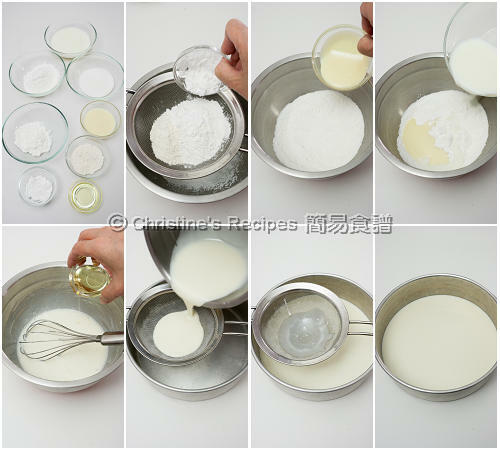 Simply cook the flour in a frypan without any oil over medium-low heat, stirring occasionally. When smoke releases and the flour turns light yellow, it’s cooked. Remove from the heat and let it cool down completely. Then you can use it to coat your mooncakes. Hi Christine, I've successfully made the mooncakes. The skin was soft and chewy initially but turns hard the next day. I've kept it refrigerated in a container covered with kitchen towel. Please advise. Hmm... that's not good. I don't have this problem. Then try putting them in your freezer. Transfer them to fridge two to three hours before you plan to serve them. 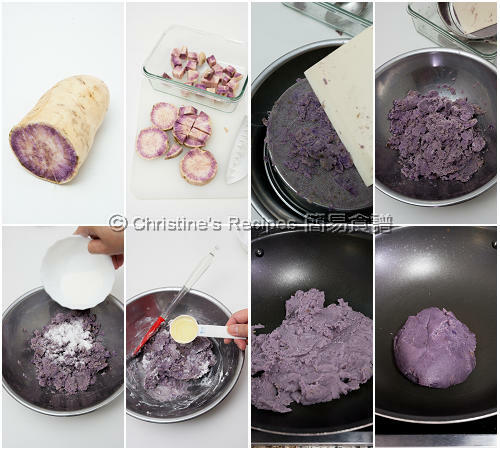 Hi Christine, can this purple sweet potato filling be used for traditional mooncake? I think you can, although I haven't tried it. We call plain flour here in Australia, the same as all purpose flour. Hi Christina, what is the purpose using milk and condensed milk? as allergy with milk, can we substitute milk and condensed milk with something else? please advise, Thank You. The condensed milk is to enrich the flavour, colour and texture. You might experiment with water and sugar(or honey), but the end result will be quite different from mine. Can I use cooked glutinous rice flour instead of uncooked glutinous rice flour in this recipe? I won't recommend it, Happee. The texture will be different. Hi Christine, I have just moved to Brisbane and wanted to do moon cake for this coming festival, unfortunately I can't find the mould here.. Anywhere u could recommend? You can order from eBay. Unfortunately, it takes time to wait for the delivery. Very nice gift. Hope you'll be successful next year then. Happy cooking! Hi Christine ,my steamed snowskin was very very sticky and thus difficult to handle . wondering if yours was sticky too and how you rectified it .Thanks ! If you find it sticky to handle, you may wear a pair of food-grade plastic gloves. And use plastic film to cover your working area. It might help. Is the yam filling suitable for those baked/fried crispy spiral yam mooncake? As the filling contain coconut milk, must I store the baked mooncake in fridge or is it alright to store in room temperature? If keep room temp without fridge, how long can keep? Thank you.